The proposal happened on 7th August 2016 at a country pub called The Throckmorton. We were alone in a big bay window after spending the day at Wayne’s parents house near Oxford. He had got the ring that day and was so nervous and worried I would find it before his actual planned proposal the following weekend that he had to do it there and then! My ring is a family heirloom that was Wayne’s beloved Aunts engagement ring and his mom had kept especially for this occasion! His planned proposal was supposed to happen on the River Avon in a rowing boat in Stratford upon Avon near where we live! And we did actually go the following weekend and he asked me again! We had our wedding ceremony at my family church in the village I grew up which is St Nicholas Church, Baddesley Ensor. Our wedding breakfast and evening reception was then at Moxhull Hall, Wishaw, Sutton Coldfield. 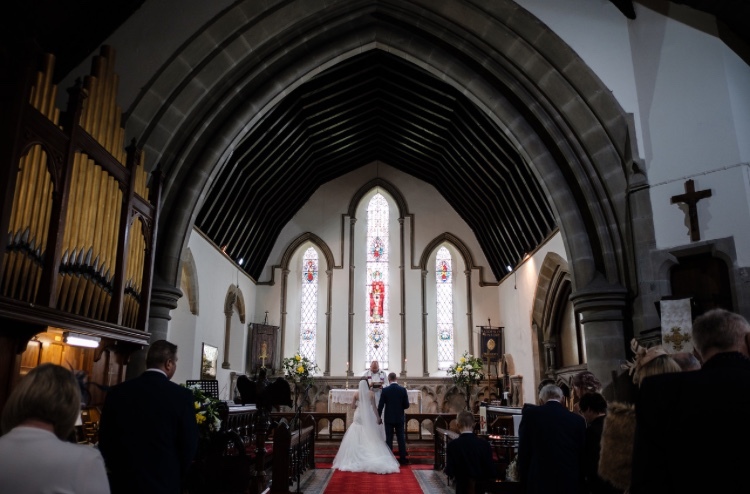 The church was an easy decision for us as Wayne was adamant that we had a church ceremony and so that only left one place to do it as our son is buried at the same church, my parents were married there and I was also christened there. 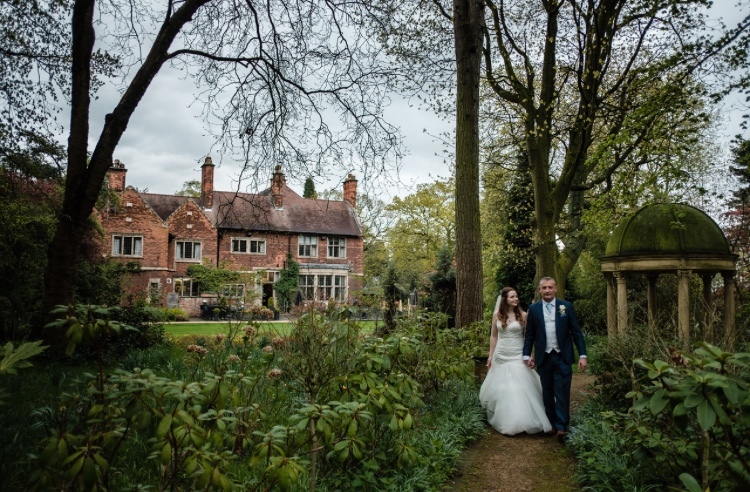 We chose Moxhull Hall after our first visit and didn’t even see any other venues! I never knew it existed, it was my dad who knew of the place due to fact it is close to Aston Villa FC training ground, of who my dad is a life long devoted fan! I found The Bridal Boutique Warwickshire through Perfect wedding magazine! You were featured in recommend boutiques due to the awards you have won and it also happened to be quite close to where we live! I put it on and immediately felt like a queen!! 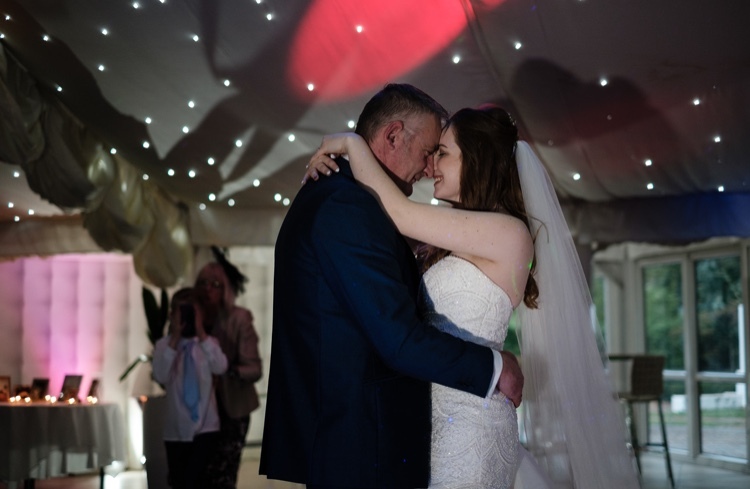 The detail of the beading on the dress was amazing, it was fitted exactly how I’d imagined my dress to be but still a little bit princessy with the gorgeous tulle train and had just the right amount of sparkle! Thank god Madi made me try it on!! As my dress had so much beading detail on the bodice I kept accessories to a minimum. I wore a sterling silver locket necklace I already have that contains a picture of our baby boy. My shoes were Ivory satin courts from Ted Baker with a bow on the front. And I also had a long single layer cathedral veil that fell perfectly onto my train. Above where my veil was inserted I had a row of Gypsofilia flowers in my hair. I had two maids of honour as I couldn’t chose between my sister and my life long best friend! And then I had 3 little ones as flower girls, my niece who is 3, step-daughter who is 7 and our own daughter who is 1. 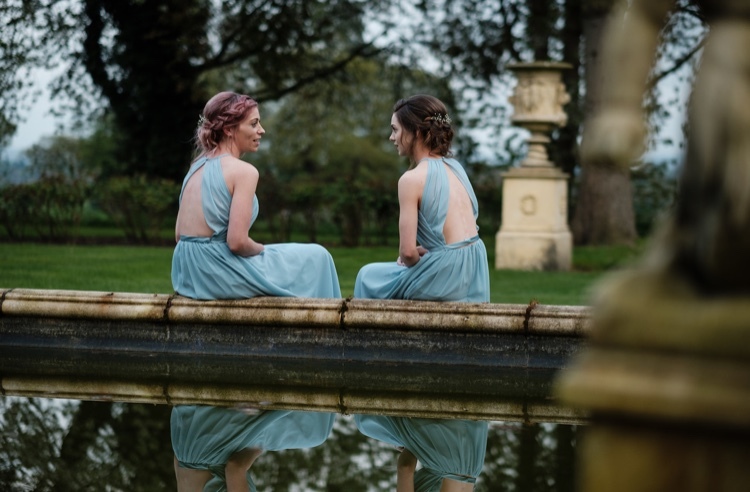 My chief bridesmaids had their dresses from The Bridal Boutique Warwickshire. 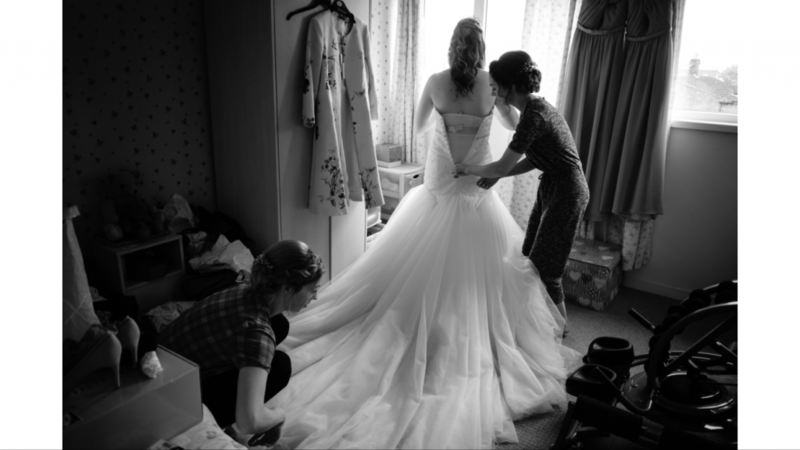 They were surprisingly easy to please and we chose a stunning Sorrella Vita dress. We had a blue colour that was a mix between ice blue and Tiffany blue as I wanted a light blue colour palette in honour of our baby boy. 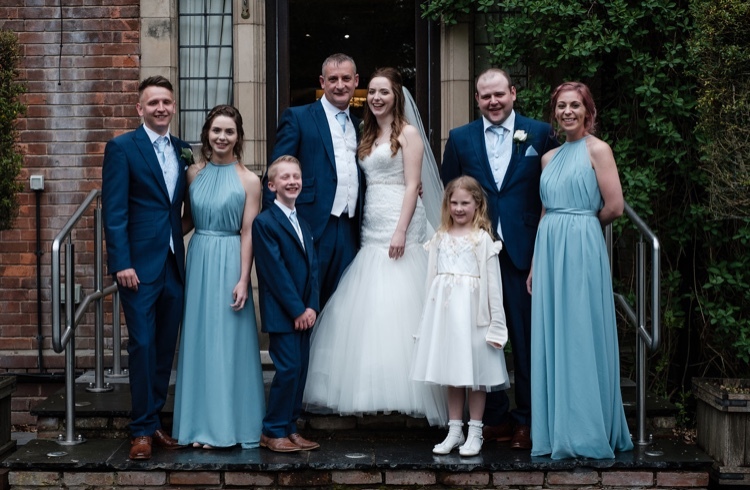 The little ones were dressed in Ivory dresses with peach and blue flower embellishments paired with ivory satin shoes and an ivory cardigan. The groom and groomsmen wore a royal blue mohair suit. Wayne had an ivory waistcoat with light blue tie & pocket square. The ushers and best man had ivory waistcoat with blue swirl, blue tie & pocket square. They all wore brown brogues to finish off the look. The whole day itself was magical!! It was very relaxed and fun as our daytime consisted of just close family. The evening reception was party time once all our friends and extended family arrived! 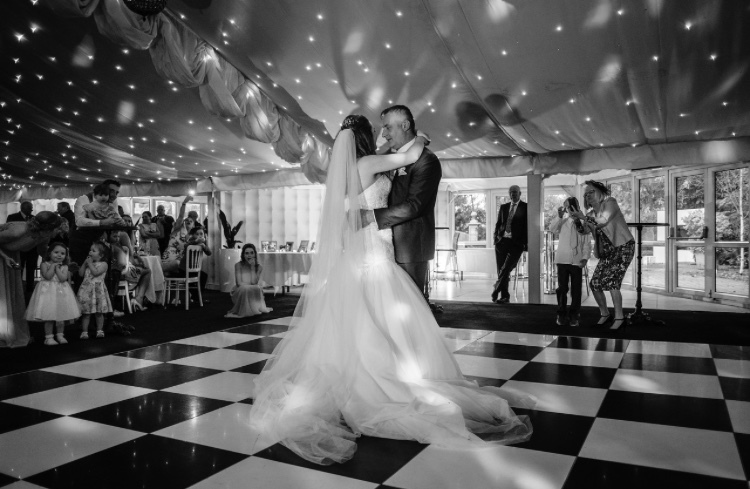 Everyone danced the night away until the early hours! Aimie wears Essense of Australia from our boutique.